John Tavares, the top prize in this year’s NHL free agent market, chose to sign with the Toronto Maple Leafs over five other teams on July 1st to live out his “childhood dream.” Tavares, whose contract is reported to be $77 million over seven years, chose Toronto after having narrowed his prospective options to not only the Leafs and his previous team the New York Islanders (who could have offered him an additional year), but also the Boston Bruins, San Jose Sharks, Dallas Stars and the Tampa Bay Lightning. Although money and potential tax ramifications play a role in where free agents sign, it is not the only reason a player chooses to sign with a team. This article provides analysis on the true value of John Tavares’s contract after taking into consideration his potential tax implications and time value of money. This article sought to answer two questions. First, how much additional income tax will Tavares pay by signing in Toronto in comparison to his other options? Playing in Toronto creates a unique tax situation as Tavares will not only be exposed to Canada’s Federal tax rate, but also to Ontario’s provincial tax in addition to paying non-resident US state and City tax based on the team’s road schedule. Secondly, the article ranks Tavares’s contract in terms of true value in comparison to other elite forwards. While the details of John Tavares’ contract are easily obtainable, and widely reported by news outlets, determining the true value takes considerable analysis. 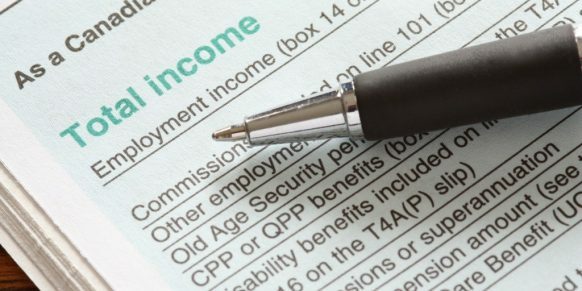 To determine the true value, two items need to be taken into consideration – tax liability and the time value of money. There are two major factors which effect the tax liability of an athlete. First is the state or province in which you are a resident or in which your team plays and the second is the team’s schedule of road games. Although all hockey players incur either US (37%) or Canadian (33%) federal tax liability on their total earnings, their exposure to provincial, state and local taxes are dictated by the team’s home and away schedule. Therefore, Tavares as a Leaf, is not only taxed in Ontario at the resident rate of 13.16% (when the 56% surtax on income over $89,131 is taken into consideration that rate jumps to 20.53%) – he is also subject to nonresident tax in each jurisdiction the team plays. During the 2018-2019 season, the Leafs play in 19 different jurisdictions that enforce non-resident state and city taxes (AKA Jock Tax) that range from a low of 1% (St. Louis) to a high of 13.3% (California). The table below list the 19 jurisdictions (including Ontario) that Tavares and his teammates will be subjected to tax along with their corresponding tax rate. QUESTION ONE: What cost did Tavares signing in Toronto have in comparison to his other options? In evaluating John Tavares’ tax situation, it is assumed he will be a resident of Canada and Ontario. Therefore, by playing in Toronto, Tavares will face a tax rate of 52.13% as he receives a foreign tax credit for taxes paid in the US (state and city income taxes). Prior to signing his contract, Tavares had narrowed his options to six teams. Under the current CBA, Tavares’s former team, the Islanders were able to offer him an additional year. Therefore, for the Islanders, we calculated the additional year with same average annual value (AAV) – while using the actual contract value to calculate the net value after tax for the Leafs and the remaining four teams. Tavares paid a steep price to sign in Toronto. Despite having the ability to offer Tavares an additional year at $11 million, the New York Islanders would not be able to bridge the $4 million advantage provided by the absence of an income tax in Florida and Texas. However, it did provide the Islanders a $4 million advantage over Tavares’s chosen destination, Toronto. Clearly, Tavares has paid a steep price, upwards of $8 million, to chose to live out his childhood dream. Tavares loses out on $8,376,351 net by signing in Toronto as opposed to Tampa. Therefore, Tampa as well as Dallas and Boston, could have proposed a contract at a discount and still exceeded Toronto’s net. Tampa could have offered $14 million less and their net value still would have exceeded Toronto’s $77,000,000 offer! Dallas could have nearly matched Tampa in their tax savings and even Boston could have offered $9 million less and still had the net value be greater than that of Toronto’s contract. To look at this through another perspective, we could ask the question; at what premium should Toronto, San Jose and the Islanders offer to match the original net after-tax value provided by Tampa? Although the Islanders could offer an eighth year, they would have needed to offer $96,482,819 while the Leafs would have needed to offer over $17,498,511 million more to have their net value equal that of the Lightnings. QUESTION TWO: How does Taveras’ contract compare in true value to other contracts signed by the NHL elite forwards? Once again, we start by calculating the unique tax rate of each comparable player (all our players’ contracts fall under the same salary guidlines as we used only those players who signed their current contracts under the rules of the most recent CBA). As the table below indicates, where the player and team reside has the greatest effect on that players tax rate. 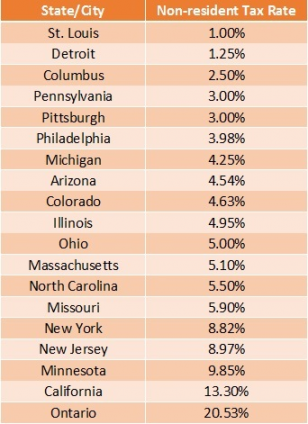 Those with the lowest overall tax rate include: Steven Stamkos, Nikita Kucherov (Tampa Bay Lightning) and Jamie Benn (Dallas Stars) who play in states that have no income tax (Texas & Florida). 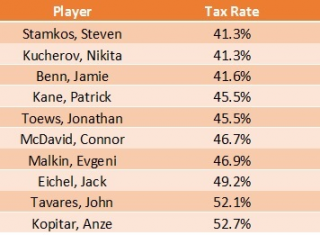 Jack Eichel (Buffalo Sabres), John Tavares (Toronto Maple Leafs) and Anze Kopitar (Los Angeles Kings) who are subjected to the highest tax rates (New York, California and Ontario, Canada) appear at the bottom of the list. The gap between Stamkos and Kucherov’s tax rate of 41.3% and Anze Kopitar’s 52.7% is substantial and effect the players’ after tax value of their contract. The player’s tax rate is only one component used in determining the net value of a contract. How the contract is structured and when the money is to be received is just as important. Therefore, to compare contracts signed during different years and structured differently all net dollars should be brought into today’s value. A basic financial principle states the value of a dollar received today is more valuable than a dollar received tomorrow – because of the ability to invest that dollar. Therefore, time value of money plays a significant role in analyzing the overall value of a long-term contract. The value of Evgeni Malkin’s contract, whose first year of the contract was 2014, will be significantly more valuable, than those contracts that will begin this year. In addition, those who have, either earned or will earn a majority of their income in the early years of their contract will prove to be more valuable than those who earn a flat salary over the term of their contract. To convert money earned either in the past or in the future into the present value, we used the average increase in the NHL salary cap of 4.73% over the past six years. Using this percentage in the present/future value formula(s), we can convert all dollars into today’s dollars either which will provide an increase or decrease in the contract’s net value, based on when the money is earned or when the dollars are expected to be received. This will provide an accurate depiction of the true value of that contract. By taking each player’s tax liability into consideration along wih the time value of money, the following chart reflects the true value of each player’s contract: where the “net value” is the player’s after-tax income and “true value” reflects that amount in today’s dollars. In comparing Tavares to the other top NHL contracts for elite forwards, he places dead last. Although John Tavares’ total salary is $9 million more than Steven Stamkos and earned in only seven as opposed to eight years, Stamkos’ true value exceeds that of Tavares contract by $6,308,450 million in today’s dollars. Therefore in order for Tavares to match Stamkos’s contract’s net value he would need to earn $9,130,436 in year eight. An interesting note is Connor McDavid’s $100 million contract exceeds all in gross value, however, when one takes into consideration the tax and time consequences of his deal it falls just behind the net present value of both Kane and Toews. This is since $53,400,000 or 63.57% of Kane and Toews contracts have already been earned, as opposed to McDavid’s who needs 100% of his salary discounted. The same scenario applies to Stamkos’s and Kucherov’s contracts. Even though Kucherov’s gross salary is $8 million greater than Stamkos his net present value is $2,392,903 less as Kucherov’s new contract isn’t set to begin until 2019. There are always strategies to help alleviate your tax situation, however at face value John Tavares paid a price to live out his “childhood dream”. Even when compared to Steven Stamkos’ contract, which many believed included a home town discount, Tavares’s deal still falls short. It is important for teams and agents to understand the potential tax consequences that professional athletes face. By quantifying the advantage or disadvantage as shown in the Tavares example above, a team or agent can systematically adjust their contract proposal depending on the teams in competition for the player’s services. ALAN POGROSZEWSKI is President of AFP Consulting LLC, which specializes in the consulting and preparation of professional athlete’s international, federal and state taxes. Mr. Pogroszewski is also the creator of the Jock Tax Index (JTI) which was presented at the 2015 MIT Annual Sloan Sports Analytics Conference and has also been featured on “Off the Charts” by Scarlet Fu on Bloomberg Television’s Market Crashers. The JTI was used in determining the calculation in the above article as it measures how much a team’s location dictates the tax burden on an athlete because of the jurisdiction’s income tax policies and allows individuals to compare the net take-home income after tax liabilities and credits of any contract proposal between competing offers from different tax jurisdictions.